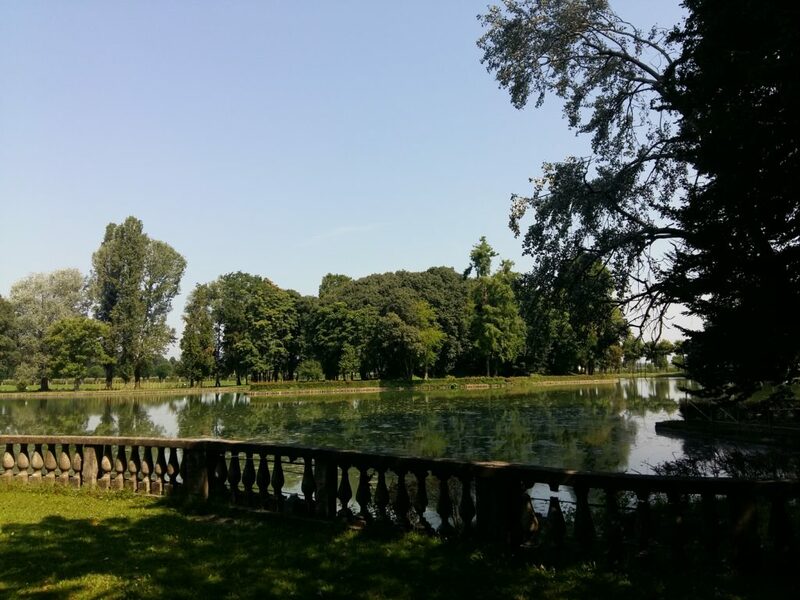 Here is a short presentation of the big park that surrounds Villa Contarini. A natural heritage to be visited. Traces of the paintings decorating the two ends of the main body of the building can be seen from the garden in front of the Villa. They were made in the mid-17th century, when Marco Contarini commissioned a great number of decorations. Today the frescoes are seriously damaged, but they can still be seen as they were as a whole in some photographs taken in the 1960s. The external decoration, composed of three overlapping bands, featured a few Atlases carrying a false cornice in the lower band. The central band, at window level, showed the personification of the Seasons – Autumn and Winter on the left, Spring and Summer on the right -, vases with couples of cherubs, and monochrome images in the centre with episodes of ancient history: a battle scene on the left, and a military triumph on the right. Finally, on the upper band, allegoric figures of Justice and Plenty are still visible on the left, while only Nobility can be identified with certainty on the opposite wall. The central oval figures, now almost completely destroyed, portrayed the Judgment of Paris and Apollo with the Muses. 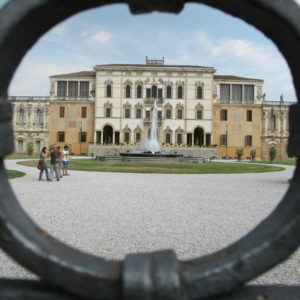 The entrance staircase to the Villa leads to a hall guarded by two lions. They are the plaster cast copies of the bronze statues made by artist Luigi Ceccon (1833-1919) and placed at the entrance of the little cylindrical temple dedicated to Duke Silvestro Camerini, built in the garden in front of the Villa. 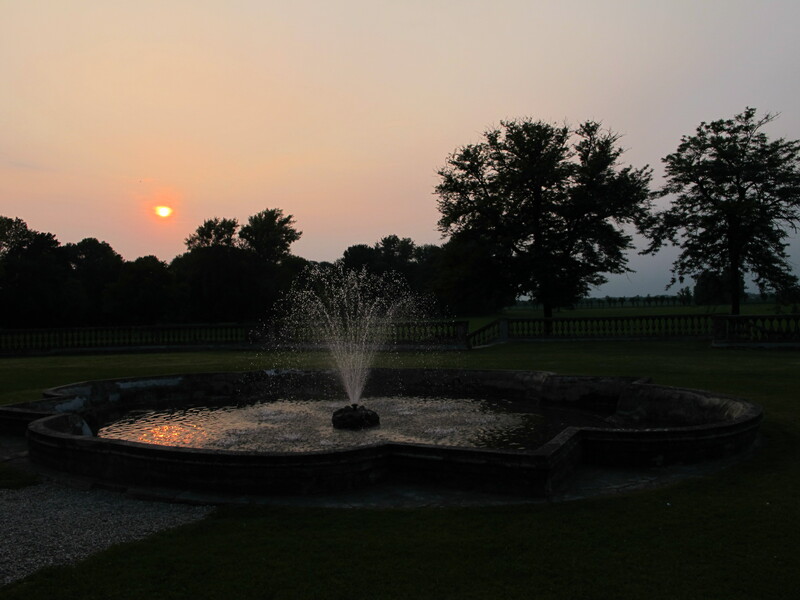 The fish ponds are one of the most ancient and evocative elements of the park. Pictures of the 17th century show that they already existed at that time and were the ideal background for banquets and parties. 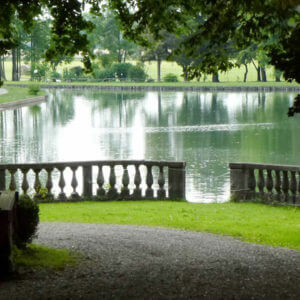 Once left the parterre to the north of the Villa, visitors can walk into the park following a path lined, on both sides, with lime trees (Tilia), and bordering the first arm of the fish pond. The latter bends abruptly to the north and in this section the trees lining the path are mainly ash trees (Fraxinus) and some black alders (Alnus glutinosa), which replaced the original lime trees. Near the corner of the fish pond, there are two little waterfalls decorated with stones and rocks, which bordered the sides of a slope descending to a water hole. Some huge masks and ruins of statues are placed on the two sides of the fish pond path. 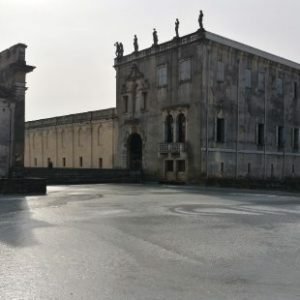 Probably this stone material would have been used for the decorations of the semicircular colonnade that, according to Paolo Camerini’s project, would have closed the semicircular square in front of the Villa, but the project was never carried out. A canal coming out of the fish pond feeds the lake nearby. 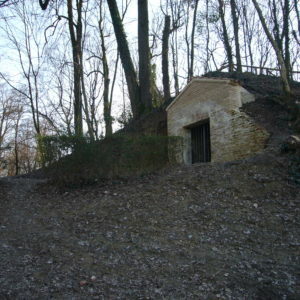 Between the fish ponds and the lake there is a little artificial hill that is formed by one of the past most important elements of the park: the ice house. It was probably built in the 18th century and beyond being useful it was considered a sort of sightseen of the park with a belvedere path over it. 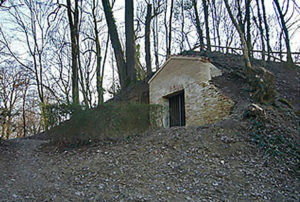 On the opposite side of the Ice House there’s a chalet (XIII), near to the lake, used to relax after the tennis matches. 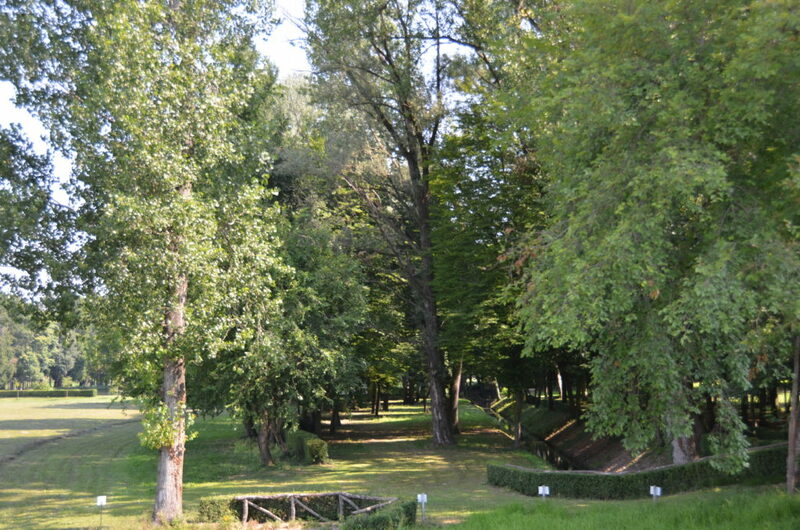 This was the place dedicated to boat trips, games and relaxing moments near the chalet (13th century). Some old pictures show elegant gentlemen ice-skating on the frozen surface of the lake. 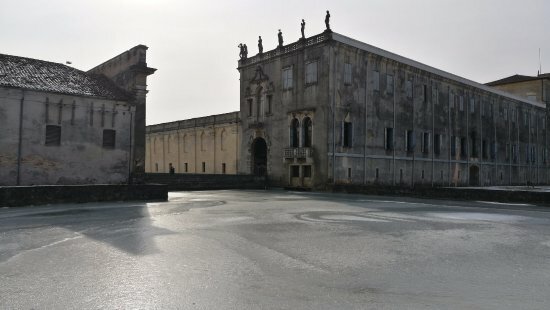 The extraordinarily scenographic view given by the stretch of water was carried out during the works for the reclamation of the area started by Paolo Camerini at the end of the 19th century. The debris was used to raise the height of the isle. The statue of the Christ of the Waters (15th century), made by L. Bistolfi, is still standing on top of it. Different species of trees grow on the meandering shores. Most of them are exotic and make the place extremely evocative. Many water birds have nested there, protected by the bushes on the shores. After leaving the lake, visitors can walk east, down the poplar-lined path that goes down the edge of the park. The rows of trees mainly consist of black poplars (Populus nigra) planted about 10 years ago to replace the original trees, which had died. 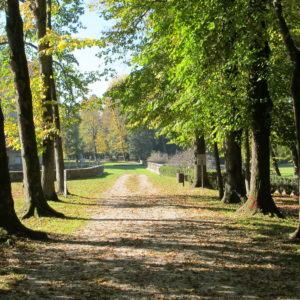 The path turns to the west into the Path of the Countesses, which, with its length of nearly one kilometre, marks the widest point of the park along its east-west axis. It consists of about 180 trees of the Robinia pseudoacacia species. They have an alternate planting density and originally the plants were regularly pollarded. This allowed obtaining big regular crowns with a spherical shape. The external path continues for 500 meters down the west border into the Horse-Chestnut Path. This path is lined with two rows of horse-chestnuts (Aesculus hippocastanum). Other tree species are present in the south-east part of the path, among which a great number of black poplars and plane trees. At the end of the external path, a lime tree-lined path connects the gate next to the church with the parterre behind the Villa. 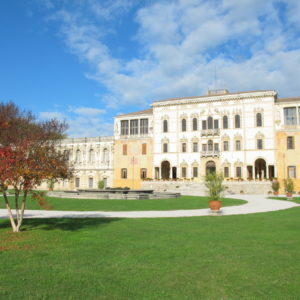 Leaning out of the first part of the balcony on the left, visitors can see a waterfall that, together with the water coming from the Roggia Contarina, feeds the winding canal that flows through the large lawn and into the lake. The parterre at sud created the garden in front of the Villa since the years 70s when it was ideated by the Ghirardi family. Before it was a normal grass park without any particular drawing as some documents of the early 20th century demonstrate. Looking more deeply into the past, we can discover that two parterres were already there (as visible on the map of the Businari of the year 1788 and the one of Maestri in the late 19th century). 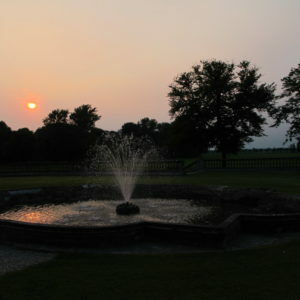 The actual one is divided into flowerbeds: two perpendicular axes and two circles at east and west plus a big circle in the middle of them where a choreographic fountain is placed. Behind the Villa the big terrace is divided with a little wall from the natural green park. The parterre is divided by little flower beds and by a fountain in the middle. The biggest fountain is called Shell Fountain and is the main subject of the parterres.